Railpictures.ca - Bill Thomson Photo: One of CN’s Turbo Trains is pictured heading westbound on the Kingston Sub at Pickering in June 1974. 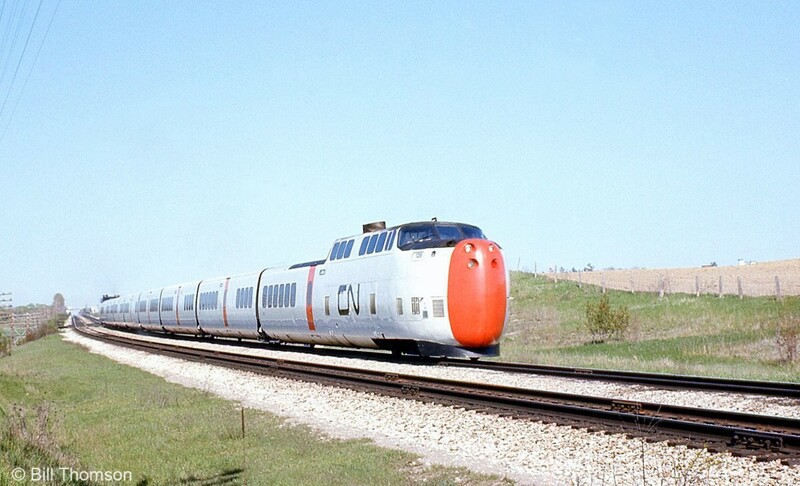 When CN introduced the Turbo they ran a press train between Toronto and Montreal to show off their latest and greatest on December 10th 1968. Unfortunately at Kingston (Division St. crossing) it hit a meat delivery truck – there were no injuries but it spoiled the show. | Railpictures.ca – Canadian Railway Photography – photographie ferroviaire Canadienne. Caption: One of CN's Turbo Trains is pictured heading westbound on the Kingston Sub at Pickering in June 1974. When CN introduced the Turbo they ran a press train between Toronto and Montreal to show off their latest and greatest on December 10th 1968. Unfortunately at Kingston (Division St. crossing) it hit a meat delivery truck - there were no injuries but it spoiled the show.